The World Cultural Heritage Monitoring Center was recently established in the Summer Palace, bringing heritage monitoring into scientific management. 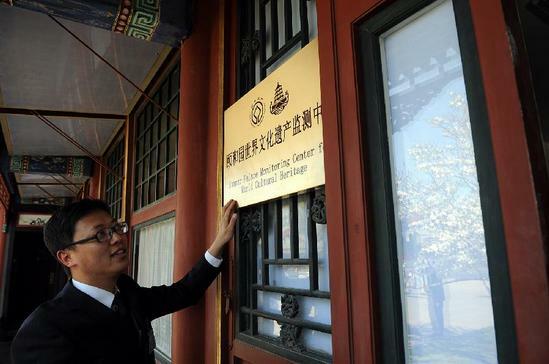 The world cultural heritage monitoring centers in the West Lake of Hangzhou and in the Imperial Palace had respectively been established in July 2011 and December 2011. China joined the Convention Concerning the Protection of the World Cultural and Natural Heritage in 1985 and owned the first batch of world heritage in 1987. At present, China has a total of 41 world heritage sites, ranking the first in the world. Tong Mingkang, deputy director general of the State Administration of Cultural Heritage, said that there are four characteristics for China’s world heritage sites. Firstly, they are various, almost including all varieties in the Convention Concerning the Protection of the World Cultural and Natural Heritage. Secondly, they are widespread, involving plains, mountainous areas, deserts, islands and plateaus. Thirdly, they range over vast time span, with the time span between the Peking Man Site at Zhoukoudian and the Diaolou in Kaiping exceeding 500,000 years. Fourthly, they are multicultural, including both heritage sites with Han culture and that of ethnic culture. Chinese wisdom is needed to publicize these world cultural heritage sites. The Chinese government poured great efforts into the world heritages. For example, Chinese financial department set up "special funds for the world cultural heritage protection" and the National Department and Reform Committee increased the investment to protect the major world heritage facilities of China. The Chinese Ministry of Culture published the "Management Method on the World Cultural Heritage Protection" in 2006 to monitor and patrol the world cultural heritage and those included in the "Preparatory List of the World Cultural Heritage in China." the world cultural heritage which suffered destruction in value, authenticity and completeness due to poor protection will be included in the "Alert List of the World Cultural Heritage in China." In December 2006, the State Administration of Cultural Heritage published "the Management Method on monitoring and patrolling the World Cultural Heritage in China," defining the monitor procedure, duty and contents and standardizing monitor conduct. At present, China’s world heritage has basically been perfected in the declaration and the protection, management and monitor system. Like other countries, China is also faced with severe challenges on heritage protection and development. The number of visitors will sharply increase in the heritage sites once they are included in "the World Heritage List." As the world’s most populous country, China’s cultural heritages are facing mounting pressure brought by toursim, said Shan Jixiang, president of the Palace Museum. According to calculation, the number of tourists visiting the Imperial Palace reaches 20,000 per day and over 100,000 per day in peak tourist season. The number of tourists at the Imperial Palace is predicted to break 14 million in 2012 and it will continue to increase in the future. We should give full play to government’s leading role, extensively integrate social resources and forces and make interaction between heritage protection and social development, said Shan. Tong said that some improper constructions during the large-scale urbanization, rural construction and reconstruction of old cities destroyed the pattern, environment and styles of the historical villages. The urbanization rapidly devoured the cultural landscape of surrounding cities and the landscape protection of historical cities is faced with unprecedented pressure. Historical villages have been empty. Historical buildings were damaged for lack of maintenance and improper reconstruction of old cities led the historical blocks to lose heritage value. During the 12th Five-Year Plan, the State Administration of Cultural Heritage will mainly carry out two works. First, they will draft the "Preparatory List of the World Cultural Heritage in China," which is credible, typical and balanced, strictly protecting the items having potential world heritage value. Second, they will establish early warning system to monitor the world cultural heritage nationwide. Now, China’s world cultural heritage protection and monitor center has preliminarily finished construction plan of the early warning system of China’s world cultural heritage. More than 10 world heritage sites in China have submitted their plans of monitor and early warning pilot places.